One of the allegedly affected Macs. The company has simply "failed to install filters for the computers' vents," according to lawfirm Hagens Berman Sobol Shapiro, representing plaintiffs Kim Ahern, Nikolas Frenzel, and Justin Evans. The firm is actively recruiting more plaintiffs, specifically anyone with a dust-crippled iMac or MacBook made since 2013. Affected computers may have "dark smudges or spots" on the inside of their displays, and/or slowdowns and crashes caused by dust accumulating on the logic board. The suit charges that people have had to pay for expensive repairs as a result, spending as much as $650 for non-warranty screen replacements when the fix might be as simple as removing the screen and wiping with a rag. Ahern, who bought a 27-inch iMac, is said to have encountered screen smudges after just nine months, and learned through Google that many other people were dealing with the same problem. Apple's support staff were purportedly unable to help, further denying knowledge of any widespread issue. "Apple's own message boards are full of reports of these widespread problems caused by the filter defect," said Hagens Berman Sobol Shapiro. Evans had the screen on his iMac replaced three times, twice at his own expense, and also paid $900 to have his logic board replaced after his computer began to overheat and slow down. The case is being handled through the U.S. District Court for the Northern District of California in San Jose. The plaintiffs' lawyers are asking for a halt to "Apple's unfair and/or deceptive acts or practices," plus damage payments, including up to $5,000 for class action members who qualify as senior citizens or disabled. Then he has an environmental problem in the location where he is using his Mac. That isn't Apple's fault. 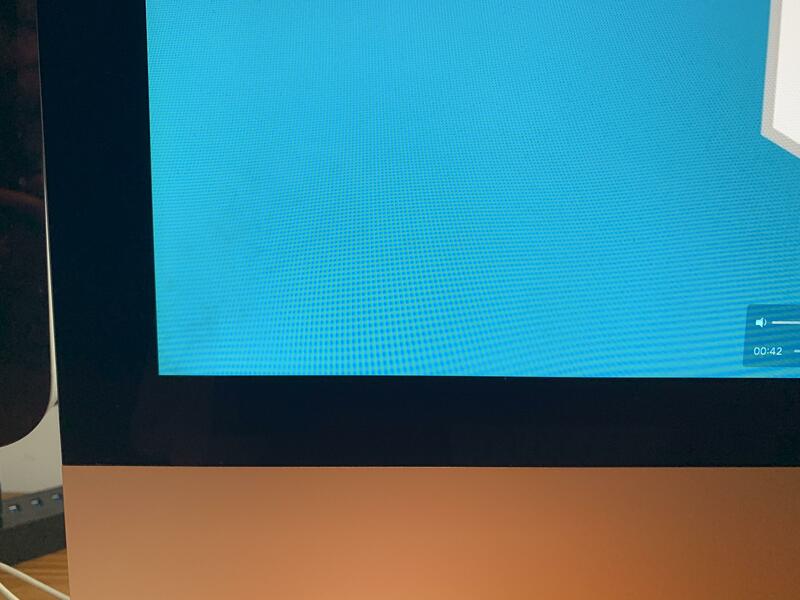 I’m having this problem with a band of dust along the right edge of the 27” Apple LED Cinema Display. The dust is not between the LED display and the outer glass cover. It’s actually inside (or behind) the LED display itself. Sounds like a manufacturing defect, not a design flaw. I’ve certainly never seen this problem personally. I doubt Apple owes anything more than a replacement. That’s not to say Apple shouldn’t investigate the issue, assuming it hasn’t already done so. And if they haven’t, then someone’s head needs to roll at Apple. Even if this is valid, why on earth should senior citizens and disabled people get a bigger settlement? That aspect of this is new to me. And wouldn't a more reasonable request be for refunding repair costs and initiating a recall? That's right. Everyone knows you can only use Mac's in completely dust free environments. Like a clean room. I'm 100% behind this class action. I think it's a design flaw. It only started happening to us with the switch to the slim profile iMacs. "I am running my iMac outside in Arizona haboob (major dust storm) and it won't work anymore"
"Sir tell me where the kitty litter is in relationship to the computer?" "I am machining carbon fibre plates for aircraft brakes in the same room"
"This was the best lawsuit I could come up with to take money from Apple"
There's also the possibility that some people just live like pigs. Anyone who claims to have had a computer replaced 3 times due to dust does not have a computer problem. That person has a dust problem. I'd also like to suggest that the very fact that something can go wrong with a product, even if that problem can be reasonably foreseen, doesn't entitle anyone to compensation. That's called a learning experience - If it broke too soon, don't buy that again. If you think I'm just an Apple fanboy, you're generally right. 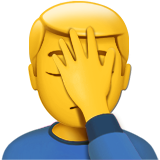 But OTOH, I am finding Apple products are getting a bit flakey for what they cost and they're generally less serviceable than ever. I'm not super happy with my year-old MacBook. Not thrilled when my $300 Beats failed pretty quickly (thanks for fixing them though Apple). Not thrilled with how an Apple Watch failed not long after the warranty was done. My daughter's MacBook was effing up the other day (overheating, wouldn't start up for several days - until it did). My wife's complains about her MacBook Pro - though that might be her. In my professional life I work with a lot of different equipment so I know "the other side" perfectly well too. I'll think about all of this (and the good stuff too) next time I need to buy things. I bought the first 5K iMac when it came out in November 2014, and it has spent the entire time in my downstairs home office where there is little traffic, and less dirt. I first noticed this condition on my screen last November, four days before my AppleCare expired, and was able to get it fixed under warranty. It was during the big iPhone battery replacement craze, so I ended up having it done at an authorized repair center in Berkeley. I just noticed a new smudge in the lower left-hand corner of the screen today, and then I found this article. I have registered with the law firm, and I look forward to Apple making this right. The photo is from my screen, today. So, if there is that much dust floating around it would be worse with a filter. Filters catch dust and require cleaning. If they are not managing the dust in the house, cleaning the filter won’t happen either. Clogged vents cause overheating and fry components. Motherboards, Screens and chips will all die under those conditions. Maybe the guy should move off the surface of the Moon to a locale with less of a dust problem. Yay...so they sued and will get a $10 Apple Gift Card in the end. 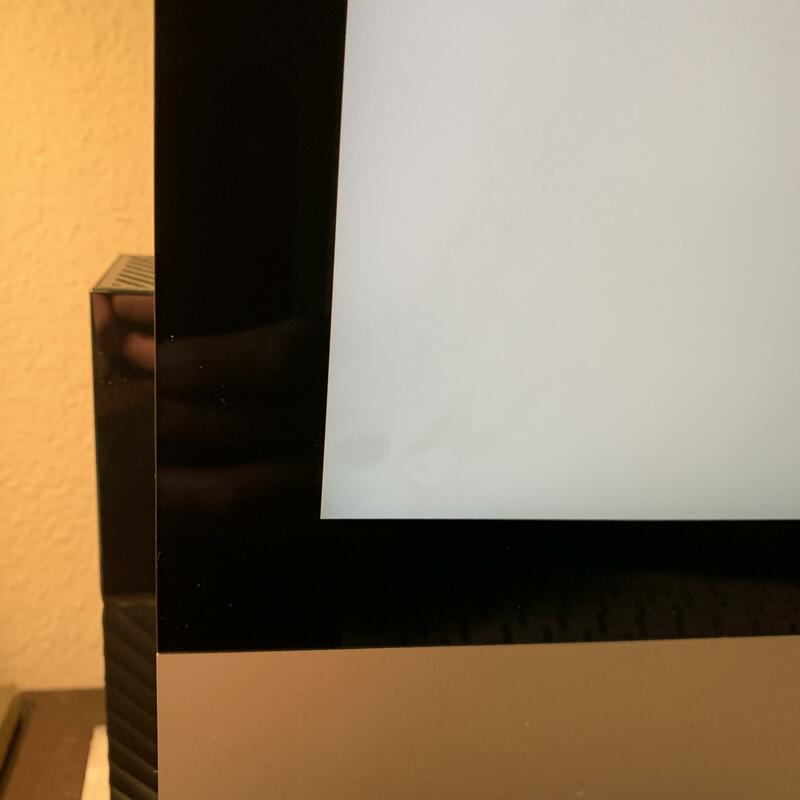 Non-smoker, no pets, no children, no carpet, single-person household, and a clean freak here with a late-2014 27" iMac with Retina display with this issue. I normally keep a dark desktop and first noticed this when doing some full-screen image editing a few months ago. I thought the outside of the screen was smudged, but upon closer examination found that it was inside the screen on both bottom corners. A quick search online revealed others with the same issue. I called Apple to see if they'd help. They politely told me to go pound sand. I'm in for sure on this CA. I had this happen with both a 2009 27" and a 2014 5k, fortunately had AppleCare on both. Happened in two completely environments, neither dirty. I don't doubt that this is happening to some users, but why some and not others? My 2014 5K does not have the problem and I can't say my office is particularly dust free, judging from the dust on the desk behind it. I think a filter would cause more problems than not having one. And yes, this is another reason why computers should be user serviceable. To remove dust that inevitably builds up. The filter or not, the dust has to be removed. Also, does any company have filters in their machines? One last thing: are these people smokers? You're completely wrong. Screen smudges have been happening for years before the slimline Macs. I had this twice now with my iMac (5K, end 2015), both times the screen was exchanged for free under AppleCare. The iMac is is a no smoking and generally very clean environment. As someone who is in the Apple repair business, including several years of warranty repair work, I think this lawsuit is nonsense. I’ve dealt with many cases where in the course of doing things like RAM or HD upgrades or replacements I would find the insides of the computer caked in dust. Computer still ran fine. An extreme example is the time I found the inside of an iMac caked with white powder. I installed an SSD into the computer after clearing out the powder. I asked the customer afterwards what was going on with her computer and she told me she often got ready for her day by powdering herself in front of the computer. Another case was the woman who called me to set up her computer. She was a hoarder who lived in a filthy house and she smoked. The computer had been purchased the previous year and was sitting out of the box on a table but still wrapped in the original clear plastic. There was a distinct yellow stain on the exposed metal parts of the computer but thankfully not on the screen that had been protected by the plastic. I set the computer up for her and the computer ran for a day and a half before it died. Wouldn’t start to save her life and the warranty had expired since it had been a year since she bought it. I took it to the Apple Store, explained the unusual situation of a year old computer which had hardly been used but had died. My story was buttressed by the yellow stain which was clearly visible only on the exposed parts of the computer. They verified my story by checking the amount of time the hardware had been used, which the computer keeps in somewhere in PRAM. Ended up charging her $50 labor for the logic board replacement because the also found the interior caked with cigarette residue. I usually find Apple to be reasonably easy and fair to work with in these situations. They’re often willing to help and bend the rules to be helpful as long as you aren’t a jerk and can clearly explain the situation to them. Computers have lacked decent (or, usually, any) air filters forever. This is an engineering mistake that we’ve been living with, for some reason, since day one of installing fans in computers. Getting into the screen, though... damn. That’s new.